Consolidated Distribution Corporation (CDC) has emerged as an innovative leader in 3PL solutions, offering food manufacturers multi-temp warehousing and consolidation services in CDC’s newly constructed, 471,000-square-foot state-of-the-art distribution center in Wilmington, IL, 52 miles south of Chicago. CDC’s value-added services helped it become the nation’s largest independent multi-concept redistributor and the leading food service supply chain solutions company serving the quick-serve, fast-casual and casual-dining restaurant industry. Palisades Logistics is proud to have this Chicago area cold storage provider in its strategic partner network. CDC’s expertise in frozen, refrigerated, and dry storage; storage of bulk commodities, retail and food service products; order selection; cross-docking; transportation management; and leading redistribution programs is the foundation for its expansion into the third-party warehousing industry, handling the needs of both food-service and retail distribution. 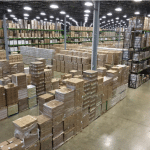 From long-term bulk storage to just-in-time inventory management, Palisades Logistics’ partner, Consolidated Distribution Corporation, employs state-of-the-art inventory management and warehouse operations systems and technologies at its Wilmington facility to carefully manage approximately 1,700 total SKUs. The ultra-modern, high-efficiency warehouse utilizes a customized warehouse and inventory management system that easily integrates with customers’ systems and business needs. In addition, CDC’s On Demand Data portal allows clients to obtain real-time inventory detail, track product movement, and create customized reporting. CDC’s Wilmington frozen facility is rail served with over 111,000 square feet presently handling approximately 500 unique SKUs on a daily basis. The facility utilizes detailed procedures for inventory, offloading, identification, verification, picking and staging functions. Because of the unique needs of many CDC redistribution customers, the company offers value-added services that many public distribution companies do not, including product launch management, kitting, and premium distribution fulfillment services — all of which they have been perfecting over the last two decades. As a result, CDC is able to produce customized plans and programs according to each customer’s individual needs. What Sets CDC Apart from Traditional 3PL Providers? How is CDC different from traditional 3PL warehousing providers? For over 25 years, CDC has individually customized programs to manage and consolidate the movement of time-sensitive items through the supply chain for the unique needs of the food service industry, resulting in savings of millions of dollars for its food service clients. Today CDC brings this expertise to packaged food manufacturers with the same potential for tremendous cost savings. CDC’s success is due to its record for seamlessly moving SKUs to their destinations on time with maximum efficiency. Year after year, CDC achieves high marks from customers for its warehouse and system storage management.